Clinical presentation A 51-year-old male patient presented to our emergency department with fever, aggravating coughing and orthopnoea. Clinical evaluation revealed pneumonia in the right lower lobe of the lung and due to typical radiological hallmarks, aspiration pneumonia was suspected. During the last months, he had suffered from several pneumonias. The patient’s history showed that he suffered from alveolar soft tissue sarcoma which was first diagnosed in 1985. He was treated with right-sided hemihepatectomy for resection of liver metastases, further liver resections, 12 sessions of radiation therapy and seven transarterial chemoembolisation sessions. 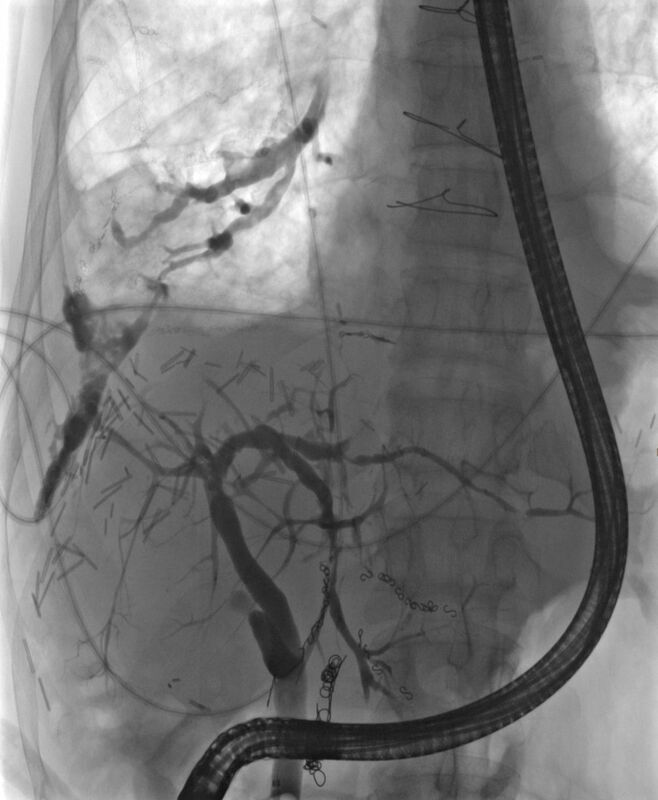 Moreover, the patient developed a stenosis of the left hepatic bile duct and required repeated biliary stenting (10F stent) by endoscopic retrograde cholangiopancreaticography (ERCP; 24 ERCPS within 3.5 years). The patient still suffered from persisting coughing with yellow sputum, although inflammation parameters were decreasing under antibiotic treatment. Further, due to elevated bilirubin levels, a bile duct stent dysfunction was suspected and an ERCP was performed showing the following picture (figure 1). Due to suspected bile duct stent dysfunction, an endoscopic retrograde cholangiopancreaticography was performed. Multiple surgical clips were detectable following extensive hepatic and thoracic surgery for alveolar soft tissue sarcoma. Question What is your diagnosis? What would be an appropriate treatment approach? Contributors JPH, JL, RT and DB were involved in the treatment of the patient. AS was responsible for performing the ERCP. JPH and DB drafted the manuscript. JL, RT and AS contributed to the critical revision of the manuscript for important intellectual content.